1. Boil sugar with 250 ml of water for 6 to 8 minutes on low heat. 2. Strain this through a muslin cloth. 3. Mix nishasta with twice the quantity of water to a smooth paste. 4. Add it to the sugar syrup. 5. Add the green colouring. 6. Keep stirring and cooking till it becomes a lump. 7. Mix the lime juice and continue stirring. 8. When the mixture sticks to the bottom of the pan, add ghee and keep stirring till it becomes a smooth lump and does not stick to the sides. 9. Add the almonds and pistachios. 11. Spread thickly on a greased tray to cool. 12. Smooth the top with a greased spoon. 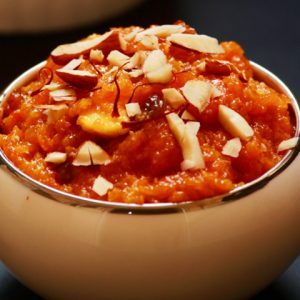 Feel free to comment or share your thoughts on this Nishasta Halwa Recipe from Awesome Cuisine.